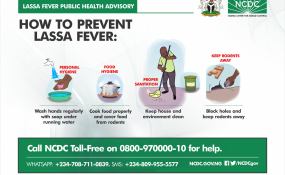 The reported surge in the number of confirmed cases this week is coming some weeks after the NCDC's claim that there has been a gradual decline in the outbreak since inception. Among them, NCDC identified 'contact tracing' as crucial in curtailing the spread of the deadly disease. This, he said has been yielding positive results. So far, a total of fifteen health care workers have been infected since the onset of the outbreak in seven States - Edo (7), Ondo (3), Ebonyi (1), Enugu (1), Rivers (1), Bauchi (1) and Benue (1) with two deaths in Enugu and Edo States. Currently, 68 patients are being managed at various treatment centres across the country: Irrua Specialist Teaching Hospital(ISTH) treatment Centre (33), Federal Medical Centre Owo (16), Federal Teaching Hospital Abakaliki (10), Bauchi (1), Plateau (3), Nasarawa(1) and Taraba (4). NCDC said a multi-sectorial health national rapid response team (NCDC, NFELTP, Federal Ministry of Agricultural and Federal Ministry of Environment) is still working in the high burden states.